Hello, I’m Lisa Carlisle, author of the Underground Encounters series at Ellora’s Cave. I’m here to talk about how I use music when developing a character. I’ve used the character development worksheets and interviews, but what really helps me picture a character and develop him or her more fully is knowing what kind of music he or she listens to. For example, in my latest release Fiery Nights, Tristan Stone is a brooding character who avoids people, thinking he is cursed. Already prone to dark moods, he sinks even deeper when he loses Maya, the light to his darkness. In his bleak moment, he listens to what else but Nine Inch Nails. When writing these scenes, I turned out the lights and listened to Something I Can Never Have and Hurt many times to evoke the misery Tristan experienced at her loss. And then I had to listen to something more upbeat so I wouldn’t sink down into the darkness with him! Music is a big part of my series since it is set in an underground goth club. So on my Web site I include playlists for each of the books, as well as other playlists that I think readers of my books might enjoy. Check it out and leave a comment if you have others to recommend. Here are blurbs for my first two books in the series, Smoldering Nights and Fiery Nights. Books 3 and 4 will be released this year so follow me on your social media of choice to stay tuned. Thanks! 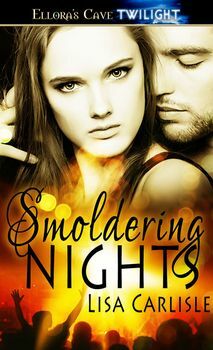 “If you are looking for a short story full of action and passion then pick up Smoldering Nights and get ready to be hooked on the series.” ~ Sizzling Hot Book Reviews. 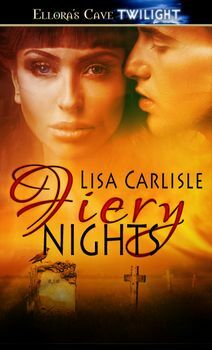 For more info on the series, including photos, playlists, reviews, and more, visit www.lisacarlislebooks.com.